This book reveals the heart of the hostile bureaucratic network operating in the shadows - until the American people voted Trump into office. Trump's determination to transform the government, wipe out the swamp, and reduce the power of the bureaucratic machine has set him on a collision course with agencies populated by a workforce resistant to the American people's agenda.That collision, however, is one that the president is prepared to meet head-on. Why? Because it is the key to unraveling the very swamp the administration is determined to end. The reader will have a front-row, exclusive seat for the political battles inside the White House and the war it is waging against those government bureaucrats, establishment officials, and foes within the Obama administration.This book exposes the political and bureaucratic underbelly, its struggle to survive against an unorthodox commander-and-chief, and its willingness to do almost anything to stop him.Click here for more details: http://boomerspeaks.com/273893/356304.html . 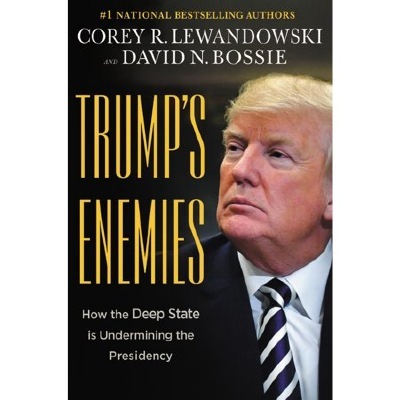 Direct link to book: http://linksynergy.walmart.com/deeplink?id=w2VGpneWfTE&mid=2149&murl=https%3A%2F%2Fwww.walmart.com%2Fip%2FTrump-s-Enemies-How-the-Deep-State-Is-Undermining-the-Presidency%2F367439994 .